Ever since I was a teenager—maybe younger—I've been whitening my teeth in some way, shape, or form. I've tried every home remedy in the book, and I've probably tried every inexpensive option out there. I know the feeling of burned gums from too much whitening gel in the dental teeth trays, and I've also tasted plenty of peroxide rinses. I've done it all! I don't drink coffee and I don't drink soda very often, but I do drink Crystal Light daily. I try to use a straw whenever I can to minimize how much red liquid gets on my teeth. I also "try" to keep up with regular brushing and flossing. AND I've found that using a self-tanner on your face can give the illusion of whiter teeth. PS: Whiter teeth also make you look more tan, so the two work together really well! 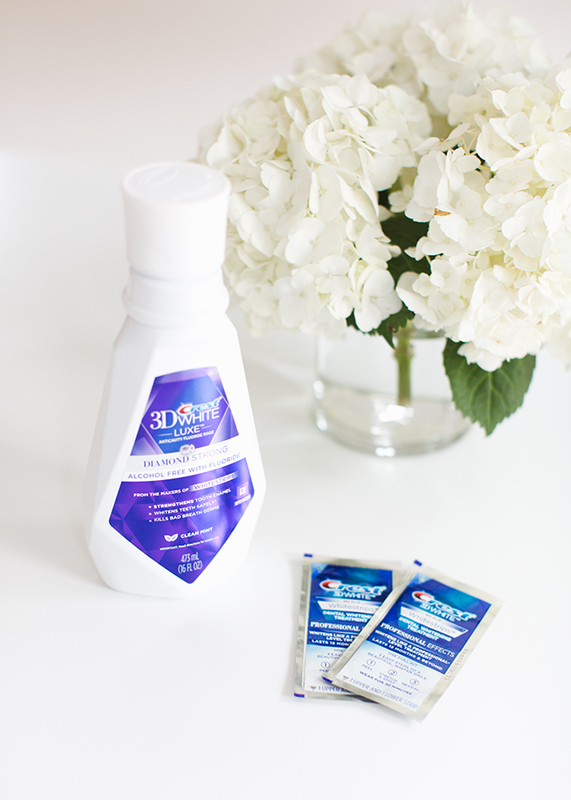 I hope that answers all of your teeth whitening questions! This isn't sponsored, but you can click affiliate links below to snag any of the products I've shared. Thank you! I loved your post! Great tips and advice! What face self tanner do you use? Thank you for your article. I'm a smoker and coffee addict, so my teeth are begging me for some whitening treatment. I was searching for some alternatives to dentist appointment (hate them soo much) and i found activated bamboo charcoal toothpaste from Virginic. I used it for one month switching with normal toothpaste and for now it's working perfectly. I see at least 2 shades whiter. What do you think about charcoal products? Is it safe? I heard it's not great to use it everyday, so I’m using it every two-three days.